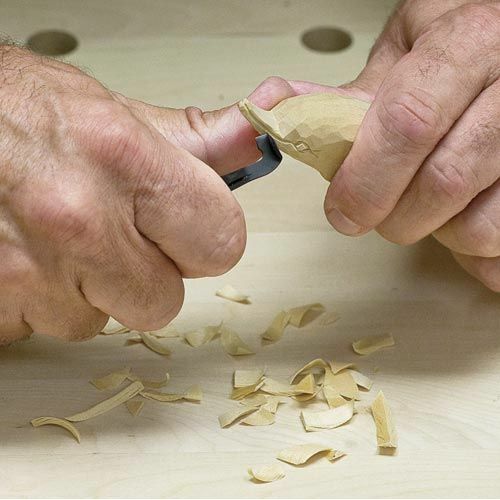 The Flexcut Pocket Jack is a complete carving kit in your pocket, making it ideal for carvers on the move and those looking to while away the hours by the campfire. 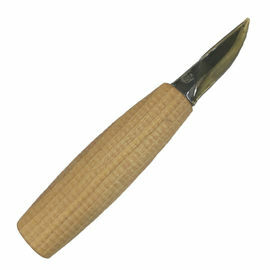 Detail Knife: Its fine point can be used for detailing delicate areas or quickly removing wood from a convex surface as you would with any whittling knife. 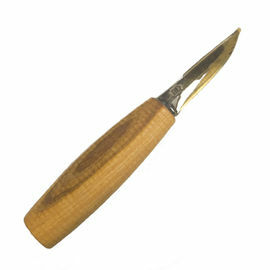 Straight Gouge: Gouges are used for modelling surfaces or creating different textures; they can also be used for carving printmaking woodcuts. Gouge Scorp: Scorps, by their nature, are right-angled gouges. Their very short turning radius allows them to carve very narrow, deep recesses - similar to spoon gouges, only better. V-Scorp: The V-Scorp's sharp corners leave a clean line of demarcation between two adjacent surfaces, much the same as outlining with a pencil. The Flexcut brand was founded in 1986 and has its headquarters in Pennsylvania, USA, where they specialise in the manufacture of innovative carving tools designed for the modern woodcarver. 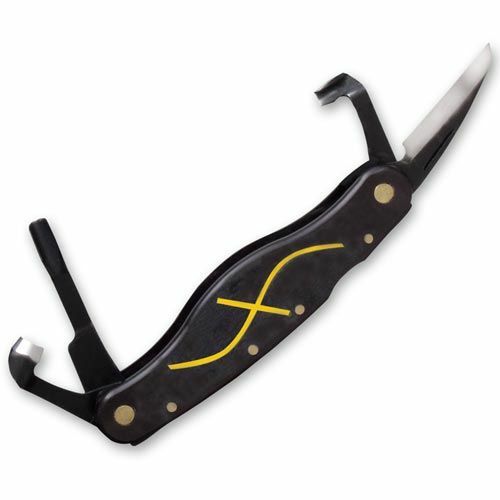 Flexcut Pocket Jack - Folding Carving Tool is rated 4/5 based on 7 customer reviews. 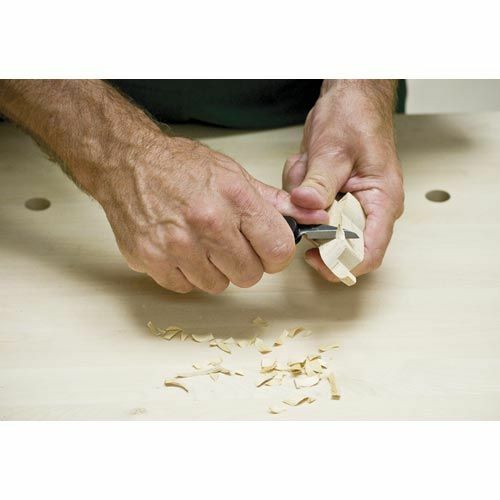 The Flexcut is easy to hold in the hand but it is difficult to get the blade out as it is quite stiff and it's impossible to get it out without the other tool that shares that side coming out. It has a good sharp blade but it is not easy to handle as you whittle. A great tool. I have never seen something similar. 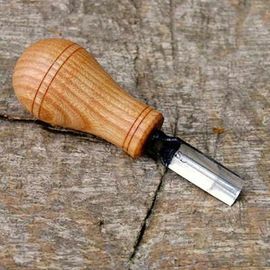 Great tool for carving, razor sharp and sturdy build; especially like the gorges for making bowls for a spoon, can even carve a tiny mustard spoon that would be impossible with the smallest of crook knife. The knife blade does need sharpening fairly often, but, not a problem if you are carrying a Victorinox sharpener in the same pocket as this knife!! Just be careful when using, those gorge blades, they really are sharp, I always wear a chef's glove on my left hand, just in case!!! This was bought as a Christmas present, so as yet has not been used! However, the service from the website was excellent, my order arrived within two days; excellent!! Have given four stars as not yet used product, but excellent service. This Pocket Jack is excellent - it's small enough to fit in your pocket comfortably and allows you to tackle some carving on the move. It's sharp and hardy. I use it when I'm out with my Duke of Edinburgh groups for camp craft lessons and also for my own joy when camping to keep the mind occupied. Great bit of kit! The Pocket Jack feels light but not too light. Extremely sharp, comfortable and seems to be of very high quality steel. If you're thinking of getting one - do it! This will not replace your spoon knife, but it is still an excellent bit of kit which fits very nicely into a pocket. Solid, very sharp and the blades allow you to carve some nice details very easily. I like it a lot. Sharpening might be awkward but a special sharpening tool is available if you can find it in the UK.